Oak Park Mall is evaluating its response to a Wednesday night shooting where several cars were shot at. OVERLAND PARK, Kan. — "One of the bullets went through my rear view mirror here,” said Adam James. Both mirrors on his wife's car were shot out. James's wife was caught in the chaos at Oak Park Mall Wednesday night , when bullets were flying in the parking lot outside the food court. She didn't want to speak on camera, but James did. He said the mall's security is lax and is a huge public safety issue. "We discovered another bullet hole that came through the rear wheel well into the house of the car and actually lodged itself right here in the center console, was really close to where my wife could’ve been sitting," James said. Several cars around hers were also hit. James said he got a panicked phone call. His wife had been inside shopping when the shooting happened. Overland Park Police released pictures of two people of interest and a dark crossover SUV that may be their getaway vehicle. "She was in White House Black Market and employees locked the door and had all the customers evacuate through the back door into the hallway. Security then told them to run out into the parking lot on their own," said James. Not knowing where to go, in fear the shooter may be anywhere, James's wife ran to her car, which was parked in front of Macy's. "Her personal opinion is that they should’ve stayed in place, that it was safer staying in the hallway. She didn’t understand why they opened the door and said 'just go,'” James said. 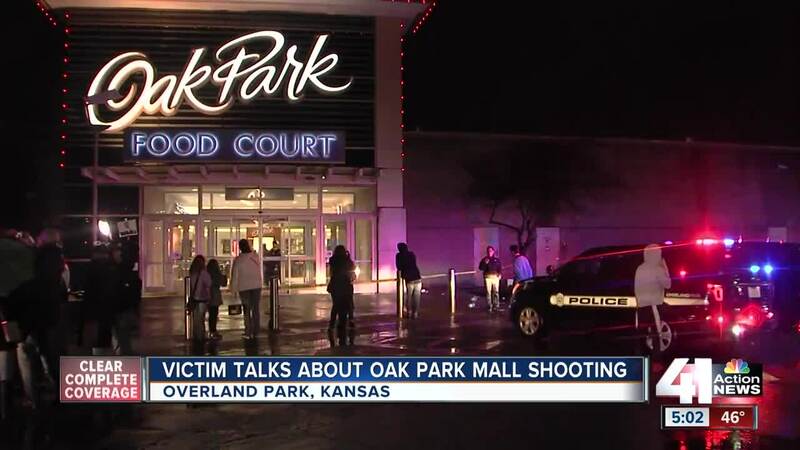 An Oak Park Mall spokesperson said they are not going to comment on security protocols, but are evaluating each store’s response to the incident. They had extra police officers patrolling at the mall Thursday. "I thank god nobody got shot in this situation, but how many more times is this going to happen before somebody finally does get shot?” James said. This is the second shooting at Oak Park in two months. But, the parking lots were still full the day after. "It's pretty safe around here, but it can always be violent anywhere you go," said shopper Monique Ridley. Many are still worried and scared after the incident, wondering what Oak Park Mall will do to up their security going forward. "I don't think you can be a prisoner in your house as a result, but at the same time there are things that need to be done," said shopper Warren Sickle. Many people, including James, are comparing this incident to other violent incidents at other metro malls. "It's up to a private mall to take care of their customers if they want them to come back, or this could turn into Bannister Mall or Indian Springs Mall or a Country Club Plaza," James said. "This is how retails die because they’re making it unsafe for us to walk in the stores and shop." Shots were fired on the Plaza in October, then a teenage girl was shot there in early December. A teenager was shot and killed at Independence Center Mall in early January 2018. Most shopping centers in the metro see well over 100 thefts and property crimes a year. Numbers for violent crimes per year are much lower, around a couple dozen at least. Since June 2018, at least 167 thefts and property incidents were reported at Zona Rosa. Since June 2018, at least 24 violent crimes like robberies or assaults were reported at the Plaza.